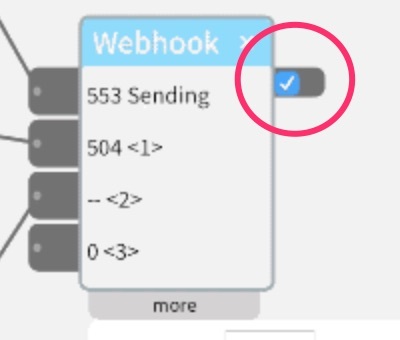 The Webhook widget sends a user set URL to any cloud service that provides webhook inputs, for example Zapier or IFTTT. The URL is sent when the first input rises above a threshold. Optionally, the widget can have up to three additional inputs whose values can be integrated into the URL. For example, it’s possible for a Zapier to send an SMS text message when receiving a webhook, and that message can contain values such as the temperature or text that can change each time the webhook is sent. Connect the trigger input to the first inlet. When the value from this input rises above the threshold, the webhook URL will be sent. Optionally, you can connect up to three additional inputs whose values will be incorporated into the URL. These inputs can be numbers or text. In the more section at the bottom of the widget, paste the webhook URL into the template field. This is the URL that the widget will send when the first input value rises above the threshold. <1> – this will be replaced by any values coming from the inlet with this label – second from the top. <2> – this will be replaced by any values coming from the inlet with this label – third from the top. <3> – this will be replaced by any values coming from the inlet with this label – fourth from the top. The <1> and <2> will be replaced by actual values coming in from the widget inlets. In order to actually send something to your cloud service, you must click on the checkbox in the upper right of the widget. This will allow the widget to send the URL to your service. When you are testing, it is best to leave this box unchecked at first so that you can test your URL template and inputs. Once you are sure everything is working as you want, click on the connect checkbox and test out your URL by setting the input to the first inlet above the threshold. Set the other parameters in the more section. min time – this setting determines the minimum amount of time between URLs sent (in milliseconds). This will help prevent too many sends at a time. Most cloud services that offer webhooks allow only so many per month, or so many per minute.